Work to transform the Dandenong Creek corridor into a world-class urban Living Link is now powering along. Our five partner councils (Maroondah, Knox, Monash, Greater Dandenong and Casey) have so far commenced works at 24 of the total 38 sites that will be completed by the middle of 2020 (when the project finishes). In 2017/18, these works included 55.5 ha of weed control and 22.5 ha of revegetation to fill ‘gaps’ in the corridor, as well as installation of artificial nesting hollows and fencing of sensitive areas. These activities will improve habitat for wildlife in this important corridor, as well as making it a more beautiful place for people to enjoy. The project also has a strong community focus, with 22 public events that engaged over 1250 people in 2017/18. These included 10 planting days, 2 litter clean-up events, 2 frog monitoring training sessions, 3 bird discovery walks, 1 night walk, 3 other educational events, and the inaugural Discover Dandenong Creek Festival, which attracted over 350 people to celebrate and learn about the natural wonders of the Dandenong Creek. To monitor the longer-term impacts of the project, we are also working to boost citizen science monitoring of frogs and birds. A single environment group, the First Friends of Dandenong Creek, completed an incredible 41 frog monitoring events in 2017/18, which provided important new records and significantly expanded Melbourne Water’s FrogCensus program along the Dandenong Creek corridor. 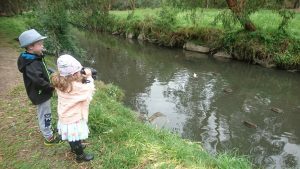 We also teamed up with Birdlife Australia to deliver three bird discovery walks to promote the annual Aussie Backyard Bird Count, in which 1096 observers ultimately took part and submitted records of 43,574 birds across the Dandenong Creek catchment (more results here). Other project activities in 2017-18 included creation of a ‘Wild Families Activity Sheet’, sponsoring a local primary school to take part in the Kids Teaching Kids program, and initiating two Masters of Research projects with Deakin University to undertake social research into community use and appreciation of the Dandenong Creek corridor. Living Links would like to thank all of our delivery partners for their fantastic work so far, the community for their enthusiastic involvement, and the Victorian Government for funding this $1M project through their Our Catchments, Our Communities initiative.